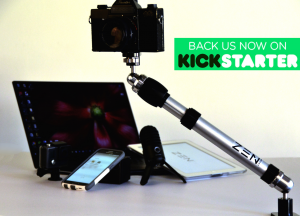 Zen Mount is a stable and highly versatile lightweight, multi-angle, telescoping mount that affixes to hand-held devices optimizing maneuverability for gadget users of all ages and abilities. Professional and semi-professional digital content producers will enjoy enhanced productivity and those living with special needs will benefit from infinite positioning capacities for use with adaptive communication technologies. The highly stable and functional Zen Mount flawless integrates in home, office, school, playground or outdoor environments. Zen Mount’s Its sleek and minimalistic design works in any decor. 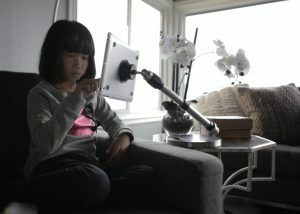 Zen Mount utilizes a unique combination of telescoping arm with pan-and- tilt action on both ball joints to make it the most versatile mount available on the market.